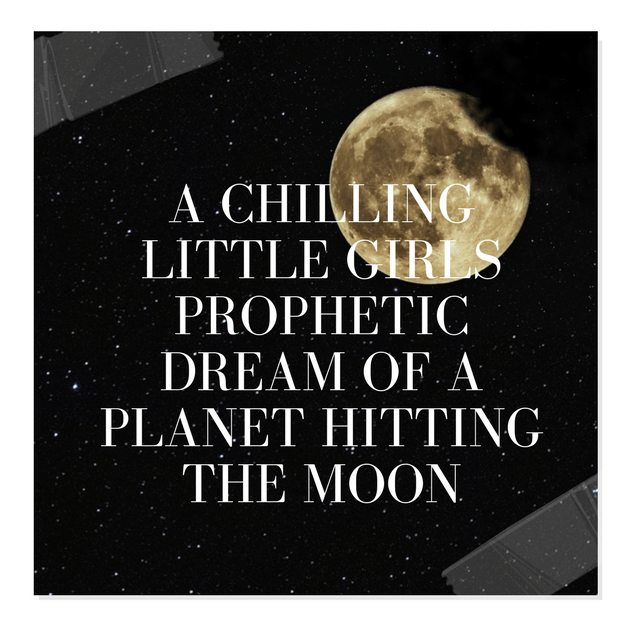 I shared a prophetic dream where a young girl had a prophetic dream of the moon being hit by a planet. 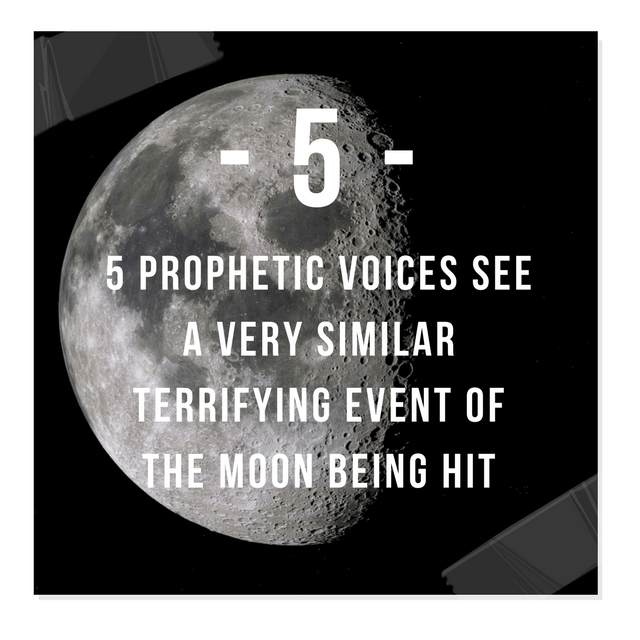 In that article I listed a prophetic dream by Joe Ouellette who also saw the moon with a large chunk missing. I hold Joe Ouellette in high regard and always have found his prophetic words and dreams to be confirmed by others over time. 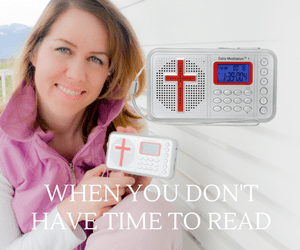 In that post we had 2 confirmations of a similar prophetic dream. A good friend of mine Jonathan Theiben emailed me today regarding 3 possible other prophetic dreams which also saw this event take place. Below are the notes Jonathan gathered up from his sources. If you follow the prophetic circles, follow Jonathan Theiben on facebook, as he also collects different prophetic voices. Hi guys, I had a quick vision within a dream. I saw people standing in frozen water looking at the moon and it exploded. I was thinking about why they were in frozen water because I live in FL and I feel The Lord led me to believe the people were frozen with fear. Early this morning I had a dream. I had woke up at 4:15 and went back to sleep, knowing this was the best time for me to have a dream that I could remember! And sure enough, God gave me one. In my dream, my husband and I were outside out night. I looked up and directly overhead was the moon. It was under some clouds but shining. Suddenly the moon rolled across the top of the sky! I looked to see if my husband had seen it and he had. As we looked back up, suddenly there was a large piece of it hurtling towards us. It looked like those asteroids in movies that are rushing towards earth, only we were on earth and watching it overhead. I saw the moon behind the piece so it had just fractured part of it. It grew very large very fast. We ran into the house to watch it on the news and I wanted to get a hold of our daughter. I was texting her but she answered her phone in error. As my husband turned on the television, there was nothing on the news about the moon. On the phone, I could hear my daughter answering questions from a game show that she was watching. I was yelling at her but she did not hear me. I had no idea how long it would take for the piece of moon to hit us. End of dream. In essence, I was driving during the day and the moon was out, looking normal at first. I looked again and something looked funny on the top left side of the moon. I stopped the car and got out to record it on my iPad. What I saw was that there were pieces of the moon…something had hit it. I recall reading others dreams on Five Doves I think….where they see the moon in pieces or things crashing into the moon. I also recall reading the dreams of a little boy who said Nibiru would push something into the moon. So NASA can see the small impacts right now, and are even monitoring them. But soon we shall all see something happen to the moon, and it won’t be on the dark side of the moon, it’ll be where the entire world sits up and takes notice. I had a dream about Nibiru. I was awake and my husband was just getting up. We were on a large balcony of some sort but back by the wall. I looked out and saw a lavender sun and sky. It was either sunrise or sunset but very close to this one on the left. As I mentioned, I was looking over a balcony but there was something like a column blocking part of my view to the left, the sun being on the right. As I moved over to my right a bit so I could see past the column, I started to see a HUGE planet! This was not earth nor was it the color of earth. It had a lot of blue and red blended together. There was a chain around the planet and a padlock in front. One chain and one padlock around a reddish blue planet but this picture is a representation. The sky was still lavender in color with this planet appearing to be at least 10 times the size of the sun which was on the right. In my dream, I logically tried to size up the planet compared to the sun and I came up with 10x the size. I started to wonder if this was real as it seemed very real! I realized this was Nibiru I was seeing. There were people closer to the edge of the balcony just walking back and forth and ignoring the sky altogether. I had no clue how they could ignore the hugeness of this planet! I started to speak about it only my words were full of stuttering like I was in total shock but wanted to tell what was going on. I could only get one or two words out at a time and my husband was facing me and ssshhing me, maybe trying to calm me down or keep me from telling the others. End of dream. There are several ways you can interpret this dream. I don’t believe it points to any absolutes so in a way it is just another Nibiru dream BUT I do see some elements that may be true. We know the sky will turn red…and colorful before this happens. I saw a lavender sun and sky. My logic kicks in here and says we normally see a blue sky and when I think of primary colors, purple is a mixture of blue and red. So blue…then purple…then red. Perhaps we’ll see a purple sky before we see the red one. The sight of Nibiru was very interesting! 10x larger than the sun…yes I’ve read messengers Words to that affect, also others dreams and visions. I don’t know how physically large it will be compared to the sun BUT in this dream, that is how it appeared and they were side by side. The chain and padlock are fascinating to me. All I can think of is that God will unlock this cosmic event in His timing. Men’s hearts are failing from things happening with geological events. Imagine when they see Nibiru! I am expecting that planet, have known about it for years now. I read dreams of people visiting it with Jesus, learning it’s a prison planet for evil. It may have instigated the Great Flood even, and could have a cyclical orbit. All this stuff, yet in my dream I was stuttering. I think it took my breath away! But when I woke up, that’s all I could think about! Lol I was excited to have that dream and even wondered if I had been having a dream or vision or if it was real. I believe we are seeing the pull of the planet, affect our earth right now and will only get worse. I know you guys all know this. I just wanted to share the dream because of the lavender sky, and the chain around the planet. These seemed pertinent to me.